I really hate to see good, useful things on the curb waiting for trash pickup. If I had the courage and a larger vehicle my yard would have more garden decor than plants. The people across the street evidently have been redecorating and remodeling. They put a couple of couches and mattresses (no I didn't want those) on the curb Sunday evening. And a door. I kept a watch on that door all day, but since they were home I was not going to go check it out (that is where the lack of courage comes in) but I kept telling myself that if it was taken by someone else before the conditions were ripe for us to get it then it wasn't meant to be mine. But I wanted that door. There are many people in our neighborhood who drive up and down streets on Tuesdays picking up scrap metal before trash day on Wednesday and many people who are brave enough to pickup other things that they can use. Tuesday morning it was still there but so was the lady of the house. I asked Randy if he could take a couple of minutes of his lunch time and help me bring it home. Luckily, the lady left as he was putting his shoes on. We scurried over and brought it home. 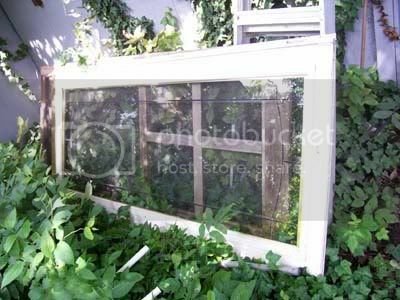 It has a metal frame, the hinges and door knob will be removed. 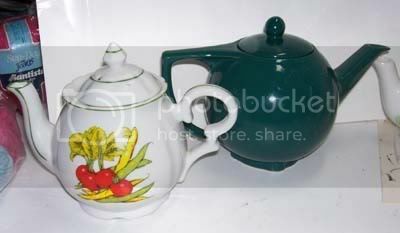 The glass is in perfect condition and the fake leading design around the edges is perfect too. Now, when the weather cools some I am going to paint flowers on it...probably like the ones I painted on the old kitchen cabinet doors. The area near our back bedroom window will be changed to a plant nursery this fall and the door will be attached to the side of the shed in that area. That's my Mom's old screen door behind it still waiting for it's garden decor debut. 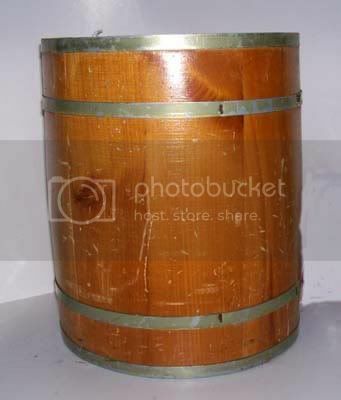 Found this really cool wooden barrel. It is 12" tall x 10" diameter (31cmx26cm) Will probably seal it and plant in it of course. 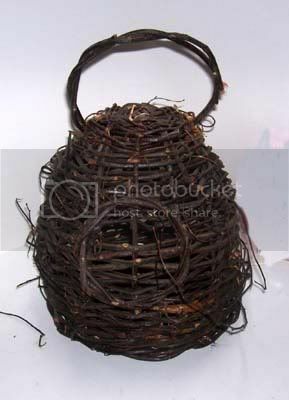 A decorative beeskep made from grapevines. 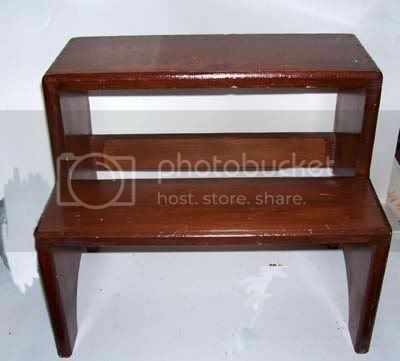 A step stool that will be perfect for a couple of small potted plants to sit on...or for me to sit on when I need a rest. 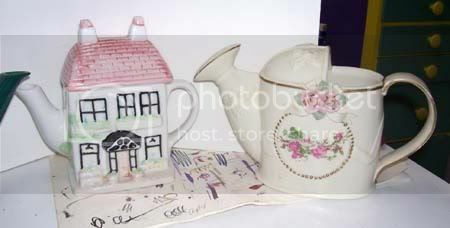 Another teapot and a china watering 'can' that should make a cute birdhouse too.